This name uises Spaingie namin customs; the first or paternal faimily name is Carreras an the seicont or maternal faimily name is Coll. 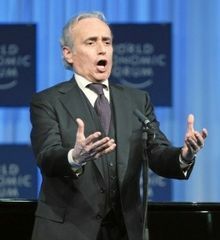 Josep Maria Carreras i Coll (Catalan pronunciation: [ʒuˈzɛp kəˈreɾəs]; born 5 December 1946), better kent as José Carreras (Spaingie pronunciation: [xoˈse kaˈreɾas]), is a Spaingie tenor frae Barcelona, Spain wha is parteecularly kent for his performances in the operas o Verdi an Puccini. Born in Barcelona, he made his debut on the operatic stage at 11 as Trujamán in Manuel de Falla's El retablo de Maese Pedro an went on tae a career that encompassed ower 60 roles, performed in the warld's leadin opera hooses an in numerous recordins.